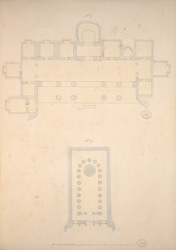 Pen-and-ink and wash drawing of the gound plan of Cave 7 and Cave 9, from an album of 26 ground plans of the Ajanta caves and 16 folios of drawings of sculpture and architectural details in the Ajanta caves, by Cpt. R. Gill, dated c.1850. The magnificent cave temples of Ajanta are situated in a horse-shoe valley of the Waghora river in West India and consist of prayer halls (chaityas) and monasteries (viharas), built for the Buddhist community who lived there. The first group was excavated between the second - first centuries BC; then, after a period of more than six centuries, the excavations restarted around the fifth century AD, in the Vakataka period. Cave 7 is a monastery from the late fifth century. The vihara does not have a hall but only two porticos supported by heavy octagonal columns. These support the overhanging eave decorated by horseshoe-shaped windows. Small cells are situated at either end. The sanctuary houses a seated and a standing Buddha. Cave 9 is a chaitya hall from the first century BC built on a rectangular plan. The interior is divided into three aisles by twenty-one plain octagonal columns. The central nave is roofed with a vaulted roof. At the end of the apse there is a hemisherical stupa. The cave has preserved some traces of paintings.